TORONTO, ON – The Summer 2010 issue of TAPS, Canada’s only national beer publication, is shipping this week to subscribers and newsstands across the country. This issue includes contributions by more than a dozen beer writers from across the country, covering brewery news and profiles, event re-caps, beer and food pairings, and many other topics of interest to beer drinkers in Canada and beyond. 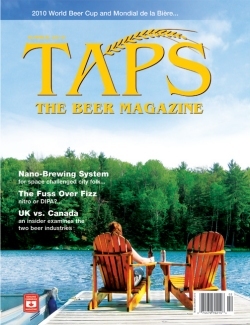 This edition of TAPS also sees two big changes for the magazine: it’s moved from saddle-stitch to perfect bound format, giving it a more professional appearance; and the subtitle has been changed from “Canada’s Beer Magazine” to “The Beer Magazine”. As editor Karla Dudley notes in her opening editorial, this latter change was triggered by an expansion of distribution into the US as well as world-wide digital availability, but the content of the magazine will still retain “a truly Canadian perspective”.